improve the order, storage and transport of tools and accessories, and of course, to facilitate the work of users. compartments, ideal for small parts, screws … or with removable compartments, which prevent the dispersion of the accessories, and also, the double side briefcases with high storage and transportation capacity for products of reduced dimensions. 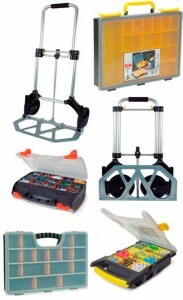 Moreover, a range of heavy duty containers for tools, further including classical tool boxes, high capacity chests with wheels for easy transport, all of these products, together with a versatile folding trolley conforms a high performance line that guarantee the best results for the most demanding users.